Of the 7.2 billion people living in the world today, not one person is exactly like you. Your perception of worldly experiences, goals, dreams, and ambitions are absolutely one-of-a-kind. With this at heart, you have a unique way of tackling obstacles and adversities. What may seem productive and growth stimulating for you may be unconducive and stunting for others and vise versa. According to Ayurveda, knowing the nature of your personal elemental framework (dosha) is the key to unlocking your true path to a productive and purposeful life. In a Pitta (fire) driven society like the United States, it is easy to lose our way and get fixed on the collective “doing mentality” and forget how to step into our personal element and simply “be”. According to Ayurveda, anything in excess in the realms of diet, lifestyle, work, exercise, etc. causes stress to the body and mind. It’s no wonder why we call this type of self- induced stress a “burnout”. This ego-trap of doing too much depletes our wellspring of energy and leaves little room for active rest and being. Important note to remember: Doing does not always equate to productiveness. Based on which dosha is predominant at the moment, you may feel called to adopt one or more of the following Ayurvedic self-care rituals listed below to help you maintain a solid ebb and flow of productivity and active rest––of doing and being. Here’s what to do when you are feeling unproductive based on your dosha. Say hello to your doshic imbalance of excess Vata (wind) energy. It is very difficult to be productive when the mind is constantly bouncing between thoughts and projects––with no system to root and structure your brilliant ideas. The irregularity and airy nature of Vata needs a system of consistency to help ground these types. Establish a consistent practice of eating, sleeping, working, etc. around the same time each day. Begin slowly by choosing one simple practice to integrate into your morning routine such as sipping hot water first thing upon waking. This is one of the best Ayurvedic practices to help calm the mind through the digestive tract and promote proper elimination. Once you’ve established this practice consistently for a week, add another practice to your morning routine such as 15 minutes of deep breathing or meditation. In this way, you will soon create structure in the form of a morning ritual that primes you for the demands of the day. Meet your doshic imbalance of excess Pitta (fire) energy. It’s easy to fall victim to thinking we “need to do more” or “we are not doing enough.” The sharp intellect and firey nature of Pitta has no problem convincing the body to keep going until it is run down and burnt to exhaustion. This false idea of productivity has a tendency to negatively affect all relationship types. Establish healthy boundaries that allot time for play and active rest––may it be going to the ocean, practicing yin yoga, or spending time with nurturing friends. Healthy boundaries also means healthy communication with your self. Encouragement over judgement can be the difference between thriving on conscious production and wilting from inordinate to-do lists. Meet your doshic imbalance of excess Kapha (earth) energy. Productivity is nearly impossible when you are feeling unmotivated, mentally bogged down, and lack luster. Furthermore, without acknowledging the need to be naturally stimulated, the gravity of this earthy energy could feel like going down the dark rabbit hole of un-productivity. Integrate invigorating activities into your routine like weight training, dancing, and power yoga to spice up your lifestyle and move prana (life- force energy) within the body. Enjoy foods like freshly cracked black pepper and fresh ginger that stimulate the mind and keep the digestive fire strong. The strength of your digestive fire is a direct reflection of your ability to process information, ideas, and thoughts. Consider intermittent fasting to jumpstart your mental and physical digestion. Your elemental ratio of the five elements––wind, space, fire, water, and earth- can be used as a tool for greater awareness of personal needs, wants, tendencies, and habits. Consider your dosha, or mind-body constitution your detailed roadmap for navigating the physical, emotional, mental, and spiritual worlds to experience a deeper connection with yourself. Meryll Montano believes that health is not a privilege, but a birthright. 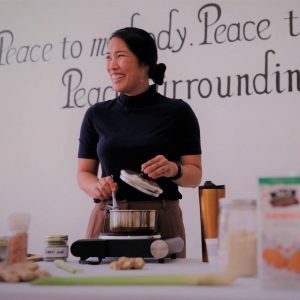 She practices as an Ayurveda Health Practitioner, Licensed Massage Therapist, Classical Hatha Yoga Teacher, Self- Taught Cook and is certified in plant-based nutrition. Her passion is in reconnecting people to the alchemy of plants to grow healthier individuals, families & communities.